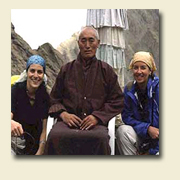 Royal Wheels India offering leh trekking, leh trekking tours, trekking in leh & treks in leh. Spiti is a small district having international boundary with Tibet. It attained the status of a district in the year 1960. Till then it was merely a tehsil of Kullu Sub-division. The valleys. 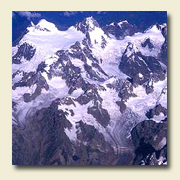 mountains, glaciers, rivers, forests, pastures, gompas (monasteries) and ancient buildings of the former ruling dynasty are the principal objects of study. The rugged awe-inspiring snow clad mountains are standing invitation to the hikers, mountaineers and adventurers. The entire district is full of natural scenery exporting the tourists and visitors to explore and imbibe its hidden grandeur. The customs, myths, beliefs and conventions of the simple unsophisticated people are the unique features of this border highland. Day 01 : Upon arrival, you will be met by our representative and transferred hotel Park (Five Star) in the heart of New Delhi. Relaxed day. Day 02 : After breakfast, we fly to Kullu (Bhuntar airport). On reaching, jeeps drive us up the valley of the Beas river to the scenic town of Manali (6700 ft). Transfer to hotel Silmog Garden. Visit the town, its mall and the Hadimba temple after lunch. Overnight stay at Manali. Day 03 : A thrilling drive from Manali to Chhatru (79 kms / 11670 ft). Camp. Today, we drive up the Kullu valley over the Rohtang pass into the Lahaul valley. We reach Chattru by lunch time to make camp for the night. Overnight Camp. Day 05 : Drive Losar - Rangrik ( 52 kms / 11800 ft). Today, we drive on to Losar village, the first village in Spiti from this direction and continue to the nunnery at Pangmo village. This is a very beautiful drive with mud towers rising hundreds of feet out of the river valley below. We reach a large riverside campsite after Rangrik village where we make camp for the night. Day 06-14 : Drive Rangrik - Kye Gompa - Kibber (15000 ft). Trek begins. Walk over the Parang La pass to the banks of the Tso Moriri, at Karzog. Day 15 : Today we visit the Changpa campsites on a large meadow above Karzog. Spend the day watching nomadic life at work. Return to Karzog by late afternoon. Overnight at Camp. Day 16 : Drive Karzog - Mahe - Leh (226 kms / 7 hrs). A long day's drive back to Leh via Mahe bridge and travelling along the Indus river valley gets us to Leh by late afternoon. Check into hotel Kanglhachhen. Overnight hotel. Day 17 : Sightseeing of Shey - Thikse - Hemis - Leh. 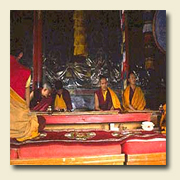 We visit the monasteries of Shey, the old capital of Leh, and the monasteries of Thikse and Hemis. Return to hotel by evening. Day 18 : Sightseeing of Alchi - Phiyang - Spituk - Leh. Today, we drive west along the Indus river visiting the monasteries of Phiyang, Spituk and Alchi. Return to Leh by evening. Day 19 : Reserve day to be kept for flight delays. Can be used at the end of the trip for an extension to Agra. Day 20 : Early morning transfer to the airport. Fly Leh - Delhi. Transfer to your hotel. Afternoon free. Day 21 : Sightseeing tour of New Delhi - we visit the Qutub Minar, India gate and the Red Fort. Evening transfer to the international airport for the flight home.